Bhaineamar an-taitneamh as an tseachtain seo! 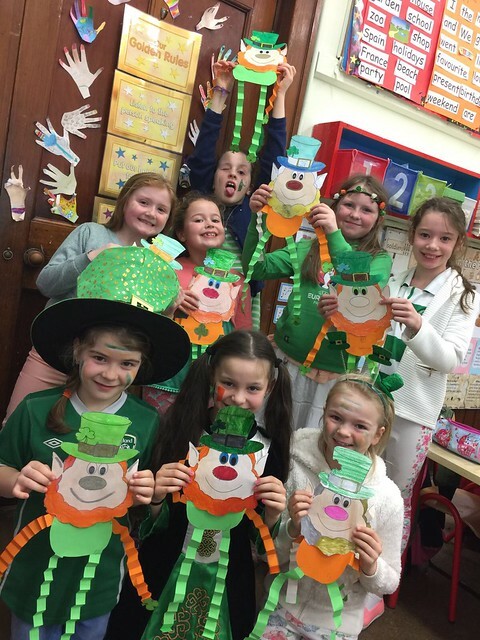 We had a great week of craic agus sparoi sa scoil as each of the classes made a huge effort for Seachtain na Gaeilge. Throughout the week the girls made an extra effort to speak as Gaeilge in their classes, in the corridors and in the school yard. On Tuesday, we had a ceilí in the halla where each of the classes performed an Irish Dance. On Wednesday, we had the trad group visit the school to give workshops to the classes. On Thursday we had 'Lá Glas' with the children and teachers wearing green! The classes came together in the hall to perform some very popular Irish songs with actions! 'Míle Buíochas' to Ms.Kearney for coordinating the week and to all the teachers who prepared the children for the activities.